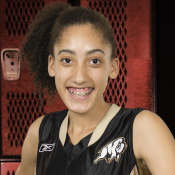 Niyah Becker began playing basketball on her community team at eight years old. Niyah’s father, Dan Becker, played NCAA Division 1 basketball, and played professionally in Europe throughout his career. Dan has also been coaching basketball for many years, including several of Niyah’s teams. Niyah, 6 ft 1’, had played on Manitoba’s provincial team for three years until this year, when she was recognized at having a skill set worthy of the national team. In addition to attending several age group national camps this past season, Niyah was chosen as one of four Canadian women to attend the NBA’s prestigious “Basketball Without Borders” camp. The camp selected players from 27 countries around the world, with NBA legends like Yao Ming making appearances. Niyah also got to attend the NBA’s all-star games as part of the deal. This past spring, Niyah made her debut with the Canada’s National Team, playing with the 17U Women’s Cadet National team, and attended the FIBA 2016 World Championships in Spain, where she helped Canada to seventh place finish. Outside basketball, Niyah runs track and loves to read. Niyah’s goal is to one day make the Senior Women’s National Team, and represent Canada at the Olympic Games. For now, 16-year-old Niyah is still in high school. She’s just finished grade 11 as part of Vincent Massey Sport School program, and has committed to the University of Utah for her freshman season in 2018-2019.